2.1 What is human resource management? 5.2 Lencioni, P (2002), The five dysfunctions of a team. 5.3 Lencioni, P. (2005) Overcoming the Five Dysfunctions of a Team. Humans are a big part of what makes up a project. Depending on the size of the project, the project team can consist of anything from a single person to several hundred people, everyone working towards a common goal. No matter the size of the project, the project management will have to make a decision about how they want to manage one of their important resources, namely the people. The project management body of knowledge (PMBOK) defines four stages of managing project human resources; Plan human resource management, Acquire team, Develop team and Manage team. Following this it becomes apparent that creating an efficient and effective project team is one of the project manager’s important tasks. In his book The five dysfunctions of a team, Patrick Lencioni describes what he claims are five dysfunctions that keep a team from performing optimally, and that need to be overcome in order to create a successful team. This article will describe how the project manager can assess these five dysfunctions, and how to overcome them. As a project manager, a big part of the job will be interacting with the team, being a leader and a mentor, and being responsible for making sure that the team performs optimally. As people make up such a big part of any project, it is natural that human resource management is a key factor to analyse when analysing project management. Personnel are also a constraint, as it is often a significant part of the budget, so it is also important for the economical aspect of a project to make sound human resources decisions. The project management body of knowledge (PMBOK) names human resource management as one of the six fundamental functions of project management. PMBOK goes on to define human resource management as the processes that organize, manage and lead the project team. These processes are Plan human resource management, Acquire team, Develop team and Manage team and are further described in the following section. In this stage, the human resource management is focused on identifying the necessary roles, responsibilities and skills for the project and to create a staffing managing plan. This is done based on the constraints present for the project, for example the estimated time line and environmental factors such as organisational structure and pre-existing human resources etc. To document the team member roles and responsibilities a project manager can utilise several types of organisational charts or matrixes to ensure that every work package has a person that is responsible for it and that all team members are aware of what their role is. The traditional way of doing this is by a hierarchical chart, which can be used to illustrate the organisational breakdown structure (OBS), the work breakdown structure (WBS) or the resource breakdown structure (RBS). Other tools that are commonly used are the responsibility assignment matrix (RAM) or text based formats, like role descriptions. The different types of charts and descriptions can be beneficial for the different aspects of human resources planning; for example can a hierarchal chart is good for the more general descriptions, but can become very complex when trying to illustrate the more specific role descriptions, where a text based format would probably be more beneficial. Another important aspect of this stage of human resource management is to gain understanding of how the organisation works and how teams and people work both individually and together. This phase should result in the project’s human resources management plan, which involves the necessary roles and responsibilities, organisational chart and a staffing management plan. This phase is, as the name implies, concerned with the acquisition of the people that make up the project team. Following the human resources management plan, this phase will ensure that there are people ready to take on their given responsibility at the given time. Depending on how the project is organised, the formation of the team can be done in different ways. Pre assigning people is done if the project is dependent on a specific person to do a job or if he or she is part of the contract. Negotiation is often a natural part of team formation, where the project management will negotiate with the potential staff’s manager, other teams or external contacts to ensure that they agree on the terms of the formation. Acquisition, or hiring, will take place if the competency or shear volume of people is not available within the mother organisation. If the physical presence of team members is not essential for the project, virtual teams can be a good solution to save money and gain the necessary competencies without massive travel expenses. When acquiring the team it is important to ensure that the right people are brought on board. This can be done by using the multi-criteria decision analysis, which rates personnel by scoring them on availability, cost, experience, ability, knowledge, skills, attitude, and international factors. Developing the team is, according to the PMBOK guide, the process of “improving competencies, team member interaction, and overall team environment to enhance project performance”. This is perhaps the most important task for a project manager and revolves around making the team the best it can be. This can be done by improving both the individual’s and the team’s skills in addition to focusing on the way the team works together. In this stage Lencioni's five dysfunctions can be analysed and overcome, but this will be further assessed in the following section. Another model for team development is Tuckman's ladder. In 1965 Dr. Bruce Tuckman published an article called Developmental Sequence in Small Groups  in which he presented the Forming Storming Norming Performing model. This model describes the stages of development most teams go through in order to reach optimal performance. It was later revised to add a 5th stage, adjourning. The stages of Tuckman's ladder is described below. Forming: The team members get to know each other and the project and agree on responsibilities. Storming: The work is starting, and in this phase the group is susceptible to conflict if the members are not open to differing ideas. Norming: In this phase the members get closer, start working better together and gain a common understanding of the work to be done. Performing: Groups that reach this stage work effectively together, they are able to work independently and work through issues smoothly. Adjourning: This added phase is appropriate for project groups as projects are temporary and the adjourning phase describes the completion of work and breaking up of the team. Being a project manager is a continuous process, and the human resource management is not over once the team is in place. Running parallel with development of the team, the project manager has to ensure that things run smoothly. By staying in touch with the members’ needs, mediating conflicts, updating the plans and making decisions effectively the project manager makes sure that the project is moving forward in the right direction. As mentioned above, managing the team is a big part of being a project manager. Especially the two last stages of human resource management revolve around this topic, and knowing what makes a team work optimally can be very helpful. In his book The five dysfunctions of a team, Patrick Lencioni describe the five factors he claims cause a dysfunctional team: Absence of trust, fear of conflict, lack of commitment, avoidance of accountability and inattention to results. He claims that these dysfunctions need to be overcome in order to become a functional team, illustrating it with a pyramid shown the figure to the right. Resembling Maslow’s hierarchy of needs, the pyramid shows that in order overcome the dysfunctions at the top, and thus achieving excellence, all the levels underneath have to be consolidated. If there is trust in a group, the members are more likely to be able to engage in discussions and be open to new points of view. Discussions are a healthy way of improving the way forward, and if the members are fearful of the way their ideas will be received or that what they say will be used against them they are less likely to disclose their opinions. When members are afraid of sharing their opinions with the group and partaking in the discussion it is likely that they will end up agreeing to a solution that goes against their opinion. This will lead to ambiguous solutions without proper direction, which can be very demotivating for the members. Every team member should feel accountable for all decisions made by the team if they are committed to it. When team members are not committed to the cause they will also be less likely to call out others that are slacking. If a team has come this far in the pyramid, then they should know that if they receive criticism it is not a personal attack and be willing to listen to the feedback without digging in their heels. Humans put a lot of emphasis on fairness. When they observe someone on their team not doing their fair share of work they themselves are more likely to end up not contributing as intently. If a team shows signs of this dysfunction the members will focus more on their own personal goals rather than those of the group. As a project manager, being aware of these dysfunctions can be useful in the two last phases of the stages of human resource management: developing and managing the team. Following the success of "five dysfunctions of a team", Lencioni published a sequel called "Overcoming the five dysfunctions of a team" in which he presents potential tools for a manager to improve the team. He provides an assessment method to evaluate where the team is lacking. This assessment consists of a series of statements the team members will give a score from 1 = never to 5 = always. Examples of statements are “Team members admit their mistakes” and “The team ensures that poor performers feel pressure and the expectation to improve” . The different questions correspond to one of the levels in the pyramid. All the questions for each level are grouped together, after which the score for that specific level is averaged based on the answers from the team. The different levels are then given a high, medium or low grade according to the average value from the assessment. High is an average of 3.75 or above, low is an average score below 3.24 and medium is in between. A description of the results following this assessment can be seen in the figure below. Lencioni also provides concrete examples of steps the project manager can take to aid the team in overcoming the dysfunctions. To help build the trust level in the team, the project manager can lead by setting a good example, asking for help, owning up to his or her own shortcomings and daring to be vulnerable in front of the team, while at the same time encouraging the team to do the same. To encourage a healthy conflict level it is important to clearly state that conflicts are not an inherently bad thing. By practicing healthy conflict where personal conflicts are discouraged and replaced with productive, task oriented conflicts, giving feedback, and praising good examples the team can agree on the ways they want their exchanges should look like. The project manager can also “mine for conflict”, appointing a devil’s advocate for every meeting, where that person is responsible for asking the opposing questions to make the team more open for new points of view. Having clear and well-communicated plans is the main way to overcome lack of commitment. At the end of every meeting the team should leave, knowing exactly what they need to do, what others are doing, when the deadlines are, and contingency plans in case of unforeseen circumstances. 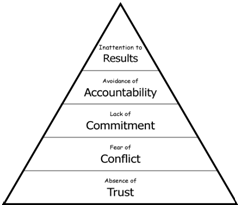 When a team has reached the pyramid level of accountability, they should already be open for criticism, as they know that it is their teammate’s right to call them out if they don’t perform as deadlines and expectations were clear. The project manager can ensure that this level stays healthy by creating an open space where the team members can give feedback and confront each other without it feeling like an attack. Having clear standards for progress and performance and team rewards are also tools that can aid in this process. When the team are approaching the top of the pyramid they need to put their own egos aside and focus on the team’s performance rather than their own needs. Praise and rewards go a long way, and the project manager needs to ensure that the team doesn’t lose sight of the goals. Being aware of these traits can be very useful for a project manager in order to develop the team to be the best that it can be. In the traditional view of project success the human aspect, or the so called ”personnel factor”, has been viewed as one of the key factors for success. Some researchers, however, question this view and claim that the personnel factor has a limited impact on the project success. According to an empirical study performed by Pinto and Prescott  the only factor that was marginal for the project success was indeed the personnel factor. The personnel factor is defined here as the “recruitment, selection, and training of the necessary personnel for the project team” . This was also backed up by a follow up study performed by Belout and Gauvreau  , concluding that although there is some correlation between the personnel factor and the success of a project, this effect was so limited that it did not seem to have a significant impact. This can indicate that human resource management may not be as critical to project success as previously believed. It is important to mention that human resource management is not limited to the personnel factor. Both studies note that there are limitations to their research, as the impact of human resources can be very difficult to measure, as the humans involved will very often impact various other success measurements. It is also important to determine what is defined as “project success”. Is the deliverable of the project the only indicator of success or is the well being of the team also an important factor? The answer to this question will of course depend on who is asked, and it is common to look at project success and project management success as two separate measures of success. It is therefore possible that although the findings of Pinto and Prescott insinuate that the personnel factor is marginal for project success, that this does not include project management success. The PMBOK is a "subset of the project management body of knowledge that is generally recognized as a good practice" . Chapter 9 revolves around the human resource management processes and tools in a project, and elaborates on the points introduced in the Big Idea section in this wiki. Lencioni, P (2002), The five dysfunctions of a team. In this book, Lencioni presents his theories about the five dysfunctions of a team and describes the many pitfalls a project manager or team can fall into. It is written as a so-called "business fable", where he illustrates his points using a story telling technique. Lencioni, P. (2005) Overcoming the Five Dysfunctions of a Team. As a follow up to the previous source mentioned, Lencioni wrote another book focusing on the techniques a project manager or team leader can use to bring the team forward. This article focuses mainly, like the name would imply, on how the different success factors vary as a function of project progression. This research is based on an empirical study they conducted, questioning 408 members of the Project Management Institute. One of the success factors they analyse is the Personnel factor, which they, contrary to their hypothesis, discover to not be critical to project success. This page was last modified on 16 November 2018, at 19:47.